Three se-tenant stamps from Great Britain reproduce photographs of St. George’s Hall, the Queen’s Ballroom, and the Waterloo Chamber in Windsor Castle. Great Britain’s Royal Mail issued 10 stamps Feb. 15 featuring photographs of Windsor Castle. Three of the stamps show exterior views of the Long Walk, the Round Tower, and the Norman Gate. A souvenir sheet depicts interior views of St. George’s Chapel, located on the grounds of Windsor Castle. A set of 10 stamps issued Feb. 15 by Great Britain’s Royal Mail takes a look at Windsor Castle from the inside and the outside. In addition to the stamps, four of which are in a souvenir sheet, the Windsor Castle commemorative set also includes two booklets. The castle dates back to approximately 1070, when it was founded by William the Conqueror. The original construction took about 16 years. Since then, it has been inhabited almost continuously and has been rebuilt and refurbished many times, most recently after a devastating fire 25 years ago, on Nov. 2, 1992. Three se-tenant (side-by-side) nondenominated first-class stamps depict photographs of exterior locations: the castle as seen from the Long Walk, the Round Tower, and the Norman Gate. The current first-class rate is 64 pence. The Long Walk was laid out by King Charles II in the late 17th century by the planting of a double row of elm trees. Queen Anne had a road constructed along the 2.64-mile path in 1710. The original Round Tower was made of timber. King Henry III had the tower and other parts of the castle rebuilt by stone in the 1170s. Today, the tower is open to the public, and those who climb up the 200 steps leading to it can see views of not only the 13 acres that surround the castle, but also five counties and the London skyline. The Norman Gate was among the many transformations to Windsor Castle made during the 50-year reign of King Edward III (1327-77). Another was St. George’s Hall, which is pictured on one of the three se-tenant £1.52 stamps featuring photographs of the castle’s interior. This immense hall was created for the knights of the Order of the Garter, and today is used for state banquets. The other two £1.52 stamps picture the Queen’s Ballroom and the Waterloo Chamber, respectively. The ballroom’s glass chandeliers were commissioned by King George III, who reigned from 1760 to 1820. Because of the many paintings of Anthony van Dyck on display, the ballroom also is known as the van Dyck room. King George IV, who reigned from 1820 to 1830, created the Waterloo Chamber to show paintings that commemorated the defeat of the Napoleon at the Battle of Waterloo. Royal Mail reported that the king also used the room for an annual banquet held on the anniversary of the June 18, 1815, battle. Today, the queen hosts the lunch for the Order of the Garter in the room. The £1.52 stamps pay the rate for mail to Europe weighing up to 100 grams. The four stamps in the souvenir sheet feature interior views of St. George’s Chapel, located on the grounds of Windsor Castle. One of the finest examples of Gothic architecture in the United Kingdom and the spiritual home of the Order of the Garter, the chapel was founded in 1348 by Edward III. Over the centuries, it has hosted many royal weddings, as well as funerals. Several sovereigns also are buried there. Photographs of the nave are shown on the two first-class stamps in the souvenir sheet. Pictured at upper left is the Sir Reginald Bray roof boss. In architecture, a boss is an ornamental projecting block. The stamp at upper right depicts the chapel’s fan-vaulted roof. The other two stamps in the souvenir sheet are denominated £1.33, paying the rate for international mail weighing up to 20 grams. They show views of the choir, spelled “quire” on the stamps. Banners of the Order of the Garter are pictured on the left stamp, and a St. George’s cross roof boss on the right stamp. The selvage of the souvenir sheet shows a photograph of the West Door entrance to the chapel. One of the two booklets is a prestige booklet with text and photographs in addition to four panes of stamps. The text, by architectural historian John Martin Robinson, presents the castle’s history, focusing on the changes made to it by monarchs over the centuries. Queen Elizabeth’s historic milestone honored on new stamp: The sapphire jubilee of Queen Elizabeth II was marked Feb. 6 by a royal gun salute and a new postage stamp from Great Britain’s Royal Mail. The first pane in the prestige booklet contains four se-tenant stamps from the Windsor Castle set: the first-class Round Tower and Norman Gates and the £1.52 Queen’s Ballroom and Waterloo Chamber stamps. The second pane has a se-tenant pair of the first-class Long Walk and £1.52 St. George Hall stamps. The third pane presents eight Queen Elizabeth II Machin definitives (one £1.05, two 2-penny, two 10p, and three first-class stamps) in a block of nine with a central label picturing a chair. The four stamps from the Windsor Castle souvenir sheet are in a block of four on the fourth pane. 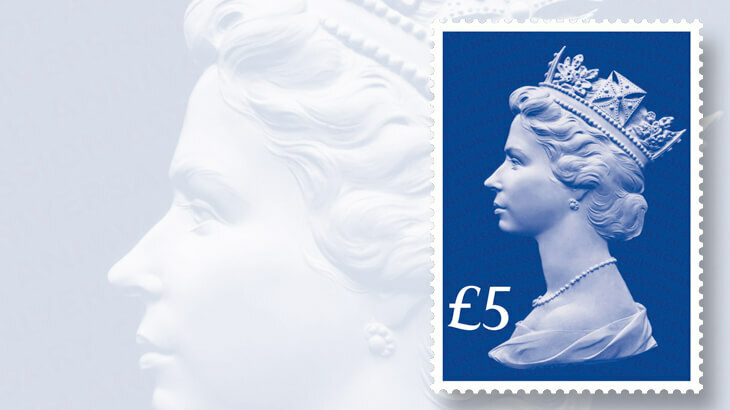 The other booklet is what Royal Mail calls a “retail booklet” and includes six first-class stamps: four Machin definitives and the Sir Reginald Bray Roof Boss and the Fan-vaulted Roof stamps from the Windsor Castle souvenir sheet. The firm Up designed the stamps and souvenir sheet, using photographs from Alamy Stock Photo, the Royal Collection Trust, and the Dean and Canons of Windsor. The souvenir sheet is 115 millimeters by 89mm, and the stamps in it are square, 35 millimeters by 35mm, and perforated gauge 14.5. The other six stamps are 60mm by 30mm each, perforated gauge 14.5. International Security Printers printed them by lithography in sheets of 60 (sold in panes of 30 at most postal outlets). International Security Printers also printed the souvenir sheet and the prestige booklet. Silk Pearce designed the prestige booklet. Royal Mail’s other products for the Windsor Castle set include first-day covers, a presentation pack with mint examples of the stamps and text by John Martin Robinson, a press sheet with 16 souvenir sheets, and 11 postcards reproducing the designs of the 10 stamps and the souvenir sheet. Ordering information is available from Royal Mail, Tallents House, 21 S. Gyle Crescent, Edinburgh, EH12 9PB, Scotland. Shop online here.